Pen #20 is a 1921 Waterman in a beautiful Red Ripple. It’s a #7 lever-filler with a “Pink” color-coded nib and matching band at the top of the cap. Waterman produced 10 nib “colors” for the #7 pen: red, green, purple, pink, blue, yellow, brown, grey, black, and white (an example of the “white” has yet to be found). Each “color” corresponded to the style of the nib. The “Pink” is usually “fine/triple-flexible” with the highest flexibility of all the nibs, and is very popular these days. 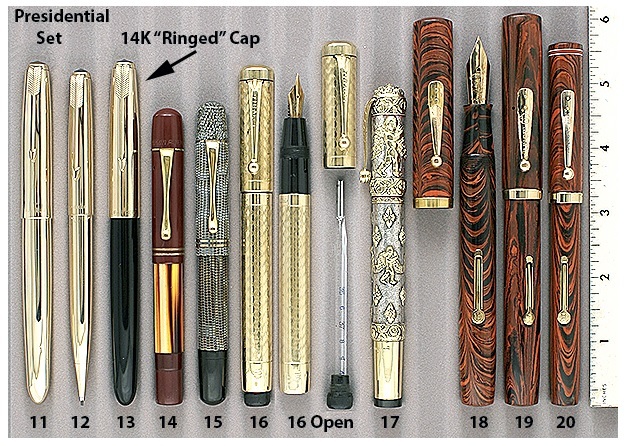 Color coded nibs were used by Waterman in other pens such as the #5, Ink-Vue, #32, 92, 94, and others. The #7 is the largest and combined with its flexibility is what makes this nib so desirable and coveted by collectors and users alike: a holy grail of pendom! This entry was posted in Vintage Pens and tagged Fountain Pens, Go Pens, GoPens, Vintage Fountain Pen, Vintage Fountain Pens, Vintage Pen, Vintage Pens, Waterman. Bookmark the permalink. Follow any comments here with the RSS feed for this post. Post a comment or leave a trackback: Trackback URL. Hi I’m interested in pen number 20, the Waterman with the pink nib. Could you tell me what your asking for it?